Taken! Tina has been taken by Felig from the home she and Nate shared and had believed Felig-proof. Just when the couple had smoothed out and polished the jagged edges of their relationship. Just when everything had fit together so perfectly. Nate is on a mission now and is learning nowhere is safe and no one, untouchable. And most importantly that allies can be found in the most unexpected of places. PJ Dean is the author of the Felig Chronicles series a post-apocalyptic paranormal/SF adventure saga. The series includes FELIG CHRONICLES, SOMETHING ELSE WICKED, and UNION. 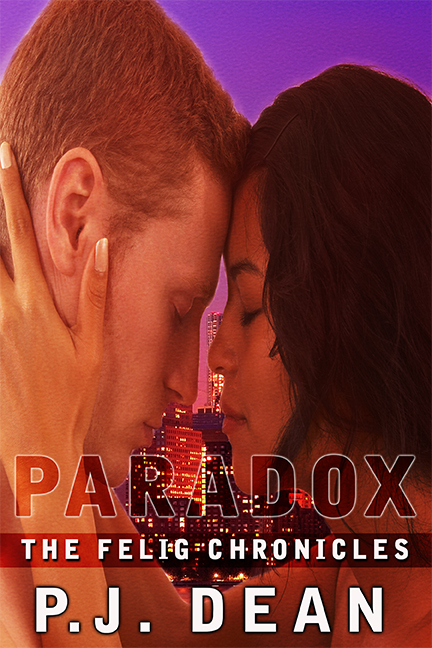 Book Four, PARADOX, is due for release later this month. PJ Dean is also passionate about diverse romance books for everyone, and you can find out more about that at her blog. RK: Diversity is a word that gets used a lot…how do you define it? Why do you think it is important to have more diverse views in the romance genre? Whoa! Do you have enough pages to spare for this answer? Truthfully, I didn’t want to delve into this question. I’ve visited several blogs where when the topic of diversity in romance publishing has been posed, it always has devolved into a virtual slugfest. The comment thread hurts my heart. So, I’ll keep this civil but pointed. My answer comes with two issues for me. Diversity in the romance industry should cover many things. It should show love in all its forms. For everyone. Between everyone. For decades, mainstream romance books have been mass produced for a target audience of a specific type of female reader with conservative tastes (a reader who didn’t really want to read about people of color, LGBQT folks, disabled people, or anyone not Christian as the leads). Not a thing to pull that reader out of the expected experience for which she’d paid. Can’t argue. The reader is due her comfort read. Said books have been penned for years by authors who stick to turning out books which preserve those tastes. The readers of the books written by these authors have never had to concern themselves with wondering what the story would read like with them in the book because the characters in the books’ pages ALWAYS were them. As for the rest of us, well…If you wanted to read a romance, you went with the flow. But now there are new sheriffs in town. It’s a new day across Romancelandia. You have a romance reading public which has increased in number and has varied tastes. Added to the audience are people of many ethnicities, people of different sexual orientations, people who are not Christians and people who are disabled and active. All quite vocal, who when they reach for a romance book, want to SEE themselves in it, and will let you how displeased they are it if they don’t. Depictions of love in romance have to continue to evolve if the traditional publishing industry wants to stay relevant and profitable. They know this and are scrambling to keep up. Yes, keep the ballrooms and the dukes in play. But make room for the interracial couples, the hot beta in the wheelchair, etc. Just don’t insult your audience with trite plots and stereotypes. The books I’ve read, and that were published by the traditional houses, try, but I see instances of opportunities lost. Where the diversity in a book is still the background noise, or gets short shrift and is portrayed through a single lens. The second part of this diversity discussion is where I have a nickel in the dime. With this hue and cry for more diverse romance books, somehow the reading public has been led to erroneously believe that unless the mainstream authors they have been reading create these diverse books, there will be no diverse books. Um…Not true. There are tons of books and there are thousands of writers who all along who have been telling stories with diverse characters as leads for YEARS. The authors are Black, Brown, LGBQT, disabled, etc. Why does the reading public, who truly wants to read such books, lack access to them? Because the traditional publishing houses do not select these other voices for publication. The excuses are legion. Don’t get me wrong. Some of the manuscripts are major dogs. But even a solid manuscript’s chance of publication is slim to none. If a writer is from one of the above groups, and shows characters from that group acting in ways other than what is expected, it probably will not see the light of day. What about existing books written by authors from those groups that aren’t being discovered? All I can say is, public, do your due diligence. If a reader really wants a diverse book, the reader is going to have to search for it. The books are out there. They are not going to be brought to you. Think small presses and self-pubbed. You may have to sift through the chaff to get to the wheat but it’s there. No, I do not object to any romance writer writing diversity in their books. I do not object to any writer not being of the community of which they write. Who am I to tell someone what they can, or cannot, write? I do not object to them receiving good reviews. What writer wouldn’t want that? What I do object to though is that these writers’ takes on diversity are being peddled as the only take. Their portrayals are pretty much the sole ones getting seen. Recall that lens of which I spoke? It seems the major publishers have selected a few mainstream authors to be the lens through which diversity is viewed. The beef I have is that it’s being done to the EXCLUSION of writers of those actual communities (Black, Brown, LBGQT, etc.) who have been writing diversity for more than a hot minute and have their view of the “other” to offer. That’s what sets my teeth on edge. Major publishers’ who have adopted that singular mindset are playing it safe, are plain lazy and are promoting a very narrow narrative of the “other” in romance writing. That’s NOT diversity. “Other” takes must be in the mix to have diversity. Isn’t that what the whole, big Twitter campaign was supposed to be about? RK: If you could have a soundtrack for a movie about your life, what songs/singers would be on it? PJ DEAN: I grew up listening to the big groups of the 70s. The Jackson Five, the Commodores, Earth, Wind and Fire, Breakwater, Mandrill, Heatwave, etc. The bands with 17 guys on stage in matching outfits and that badass bass player. So the soundtrack to my biopic would have those bands on it. RK: Which would you choose: to be captain of your own intergalactic starship or to be an agent for a covert organization of time travelers? Why? PJ DEAN: Definitely the agent for the covert organization of time travelers. I like being part of a whole but working on my own, at my pace. I’d love to pop in and out of a myriad of eras. But I insist on being invisible. More fun and safer that way. Good, thought provoking discussion. Expected nothing less from PJ! And I also go for the badass bass player. Or maybe the drummer because there has got to be a *beat*. I knew you were a music lover. How can one write about Egypt and not get behind the “beat.” Happy to get folks thinking. Thanks for stopping by. I applaud you for expressing your thoughts so eloquently and passionately. I love that. Thank you for summing it up. Thank you for having me on the blog. Yes, this diversity topic which has been floating around in the romance book publishing ether for about ten years now has resulted in little but business as usual from what I can see. If the dream for a “marginalized” writer is to see their out-of-the-norm romance book released by one of the Big 5, they will be snoozing a long time. The answer is to polish that manuscript and to submit it to a small press. And if you are truly fearless, take the self-pubbed route. Whatever the path, make sure it’s your best stuff. For all their lip service, the major houses are not interested in offering diversity unless that diversity is created in their image. I am happy I hung in there, and found an unbiased outlet for my books. My wish is that other romance writers from “marginalized” communities find a home for their work. And that readers who truly say they want those books, will find them.